There isn't much background on this one. I am tired of plain vegetable soup, I love Chinese food, (my husband is OBSESSED going on like 35 years now and no end in sight as you all know). And it is DIVINE my friends. It reminds me of when I mix half Hot and Sour Soup and half Egg Drop Soup. Yea, it is a marriage of sorts..........a beautiful one at that! I used my favorite Asian inspired veggies, homemade stock, but please feel free to use store bought. Instead of using some flavor boosters I would get at the Asian Market I decided to keep it simple with things I know you ALL can get near and far, city and country, etc. Aren't I nice? No, I really try to always do that, I am not always successful but, I think I keep it pretty real, real food, real folks that whole thing. I would also love this with pork. I would not love this with beef. If you use pork, make your stock a half and half combo of chicken and beef, it makes it pork like. Or just use chicken. I also used ginger powder and onion powder, I don't like biting down on bits of either, but I wanted the flavor in this soup. I also took the time to julienne my veggies in long(ish) thin strips. I like the look, I like the texture, and to me, it matters. I also cut my water chestnuts into sticks. I got the already sliced ones, stacked a few and made sticks. If you want a chunkier soup, well you just cut things the way YOU like them! I am hoping you will love this as much as we do, you can really change the veggies out for whatever you want but you will then turn it back into vegetable soup and didn't we say we were bored of plain old veggie soup? We as in "I"? Doesn't it bug you when people say that. A waitress will as just you, "what are WE having today". Why does that bug me? 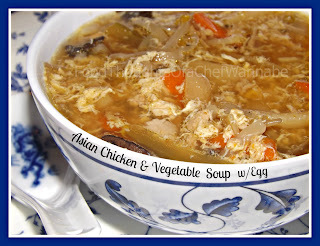 Anyhoodle, onward we go, to Asian Chicken and Vegetable Soup. Super love! 2 cups COOKED chicken cut SMALL! Prep all veggies. Heat stock, wine (if using), soy sauce, onion powder, and ginger until boiling. Add in all veggies and let simmer with the lid on for 20 minutes. In a small bowl whisk eggs with salt and pepper to taste. Remove lid after 20 minutes and using a spoon stir in circles while drizzling in the egg mixture. Add chicken and let simmer 5 more minutes. Serve! Remember my veggies were cut long and thin so you may need an extra 10 minutes if you left them chunkier! 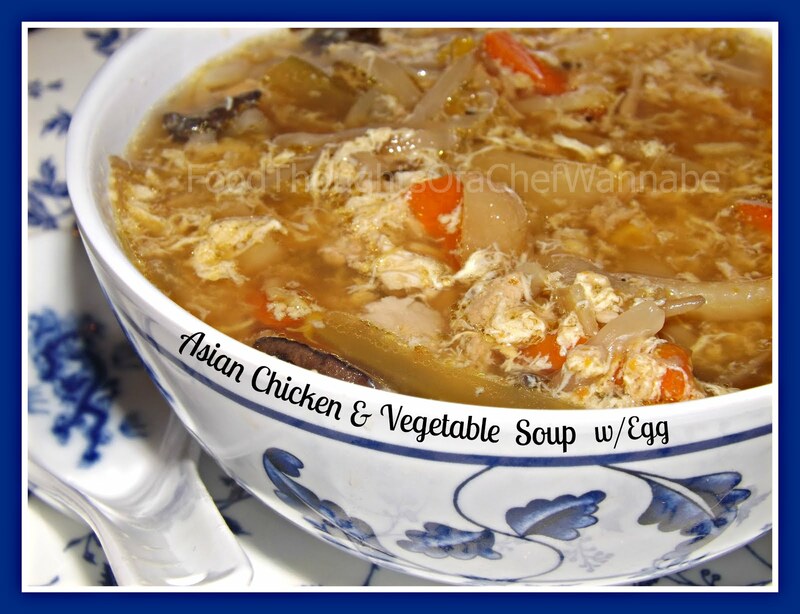 Enjoy this healthy and DELICIOUS soup! She said she cooks a whole chicken in water until it is done an hour or so. Takes the chicken out to cool, then cools the broth and de-fats the broth and returns it to the pot. De-bones and shreds the chicken with two forks and sets aside in a bowl. She then takes 5 or 6 eggs and whisks them with a fork just to mix, don't make frothy, then gets her chicken broth to a boil and starts stirring the broth in a circle and pours the whisked eggs in and stirs till they are done just a couple of minutes, then adds her shredded chicken. She also said she adds some Himalayan Natural Unprocessed Cooking Fine Grain Salt to taste and she don't add pepper unless she wants it in her bowl. She gives to people that are suffering from a cold or flu and she says it will keep for up to a week in the fridge. I am definitely going to try it soon too. This is hilarious. There are mushrooms in this soup, I just forgot to add them to my ingredients!!! The chicken soup sounds wonderful. I have a post on chicken stock, and how I make it as well. Let me know if you try this and how you like it!! My husband also added tofu to his, I just dont groove on tofu!! Thanks for reading!